This Baked Pork Chops recipe will be an instant family dinner favorite! Made with wine, apples, and shallots, there’s so much flavor in this pork recipe! Matt and I have never been an overly big fan of pork chops, but this baked pork chops recipe is giving us a whole new outlook on the dish! 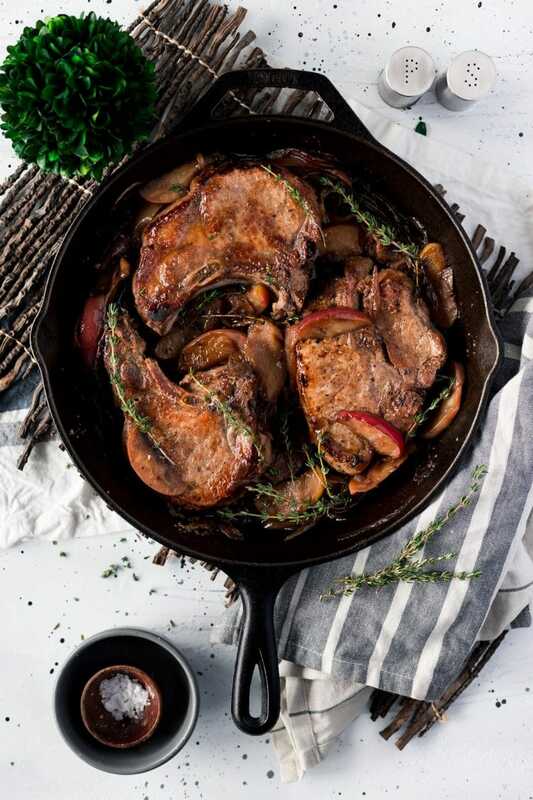 You see, we grew up eating shake n’ bake pork chops and well… they just not our style, but this delicious version that’s cooked in a skillet and loaded with flavors like apple, wine, and thyme is a comforting dish we could eat over and over again! Normally, when it comes to meat, I love a good marinade and I’m a big believer in brining. But also normally, when it comes to life, I’m just not prepared enough for a marinade. So for me, it’s important to be able to create a delicious meal rather quickly when I don’t plan ahead… pretty much every night of the week. I’m betting a lot of you can relate to that, can’t you? So here’s how to oven bake pork chops in less than an hour for busy nights without sacrificing great flavor! 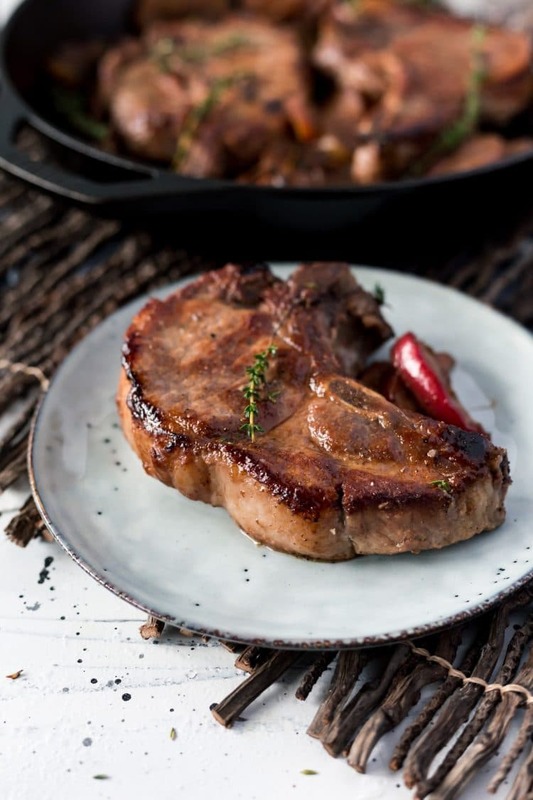 When making pork chop recipes, there are several cuts you can choose from, but I would recommend using a pork rib chop, also referred to as center-cut rib chop, as pictured. What is a Pork Rib Chop? The rib chop is considered the rib-eye portion of a pig or lamb, it comes from the section between the shoulder and the middle loin. The bone is actually rib bone, this portion of the animal can be split into boneless chops and baby back ribs as well. How Do You Cook Pork Rib Chops? Since this is a very lean piece of meat, it should cook pretty quickly. Usually, grilling, broiling, or sear-roasting (which is what I used in this recipe) is best and yields tender juicy pork chops. To sear-roast is a common technique when cooking meat. You sear the meat to lock in flavor and moisture, I prefer using either a castiron or oven-safe stainless steel skillet for this process. You sear the meat on all sides until they are a nice golden brown, preferably with a little caramelization. Then you transfer the pan to the oven to roast and finish cooking. Many people don’t like to mess with bones, but when it comes to pork chops, you want bone-in chops. Firstly, it’s just one rib bone so there’s not a tone to work around. Secondly, the bone helps provide protection from overcooking the meat. And lastly, it generally has fat around it which makes the chops more tender and flavorful. 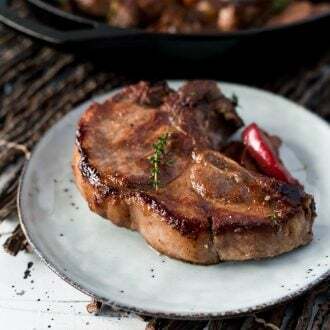 These oven-baked pork chops start off simple with a generous rub of kosher salt and pepper before searing in butter and oil (either vegetable or olive oil can be used). The pork is then removed from the skillet and side aside while you cook the apples, shallots, and thyme. Next, we add red wine, apple cider, and mustard and bring to a boil before adding the chops and any juices from the plate back into the skillet. From there, you’ll put the pork chops in the oven to finish cooking. Pork is done when an instant-read thermometer reads between 145 and 160 degrees F, I generally lean to the lower temperature for mine, but do what makes you comfortable, just know that the meat is going to rest for a few minutes after coming out of the oven and will continue to cook. Skillet: Make sure you use a skillet that can be baked in the oven. Tongs: Using these is the easiest way to maneuver the meat during the searing process. Want More Delicious Pork Recipes? Pin this Pork Chops Recipe for Later! These Baked Pork Chops will be an instant family dinner favorite! Made with sweet apples and shallots, there's so much flavor in this delicious pork recipe! Heat the butter and oil in a large cast-iron skillet over medium-high heat until simmering. Add pork and brown on all sides for about 8 to 10 minutes total and then transfer to a plate. Reduce heat to medium and add in pears, shallots, and thyme to the skillet. Cook, stirring occasionally until shallots and apples begin to soften, about 3 to 5 minutes. Increase heat to high, stir in wine and simmer until liquid is reduced by half, about 1 to 2 minutes. Whisk in the cider and the mustard and bring to a boil. Add the pork back into the skillet, along with any juices on the plate. Transfer the skillet to oven and cook until center of pork is 145 degrees, about 10 to 12 minutes. Transfer pork to a plate to rest for 3 to 5 minutes and spoon apples, shallots, and sauce over the top, serve with sweet or mashed potatoes. Pork should be an internal temperature of 145 to 160 degrees F.
Yum, this is my kind of dinner!! Pinning! Yes, you will absolutely love it! looks delicious but your Nutrition Fact graphic seems incorrect when you look at grams of protein = 1 gram. Hi PJ, Thanks for pointing that out. As will all online publications, nutrition facts are only an estimate and can vary based on a number of things. But in this case, yes, the auto calculator was way off for this recipe and I have gone in and adjusted to put calories, protein, and fat closer to where it should be. Thank you! I don’t cook pork chops very often so I appreciate all the info! Great recipe! Yum!! I feel like it’s tough to do pork chops really well, so I’m always looking for fab recipes for them. This one sounds delicious! 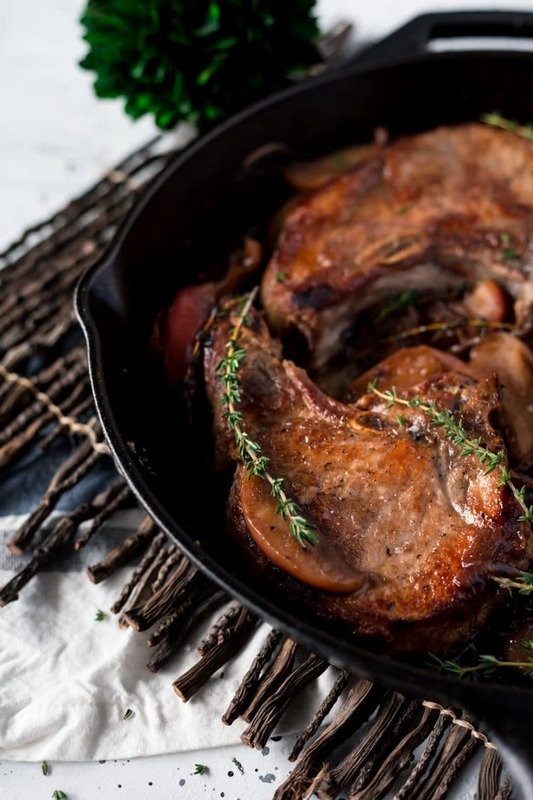 Nothing sexier that pork chops in an iron skillet! Seriously love the way this looks and I know from experience the taste is so savory and delish! Thanks for sharing this classic! Thanks for sharing the recipe! This looks sooooo yummy and flavorful! 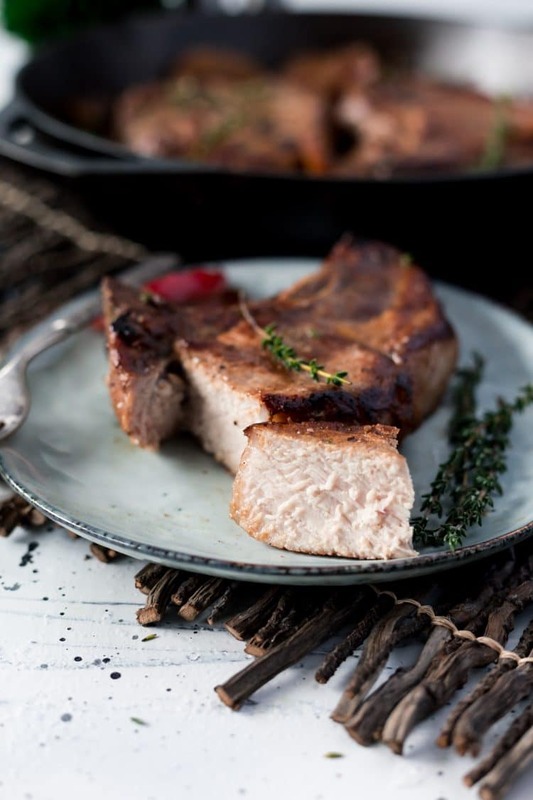 I never buy bone in pork chops but this post has absolutely convinced me to do so next time! THese sound amazing! I tried this recipe for Valentine’s Day and it was a big hit with my husband. I didn’t have shallot so I used red onions and it was still excellent. I have a little of the apple left over so today I added a pear and cooked the other three that I was afraid to cook yesterday because I did not know how they would turn out and now I know. Thank you for a very easy, quick recipe that is perfect for date night in and company.